On every month’s first Friday the hip hop, breakdance and sometimes also traditional dance groups of Lomé (Togo) meet in the Bar Nedif in the quarter Togo2000. They show each other their new choreographies, train together and plan joint shows. These are called »Just Dance vol. 1, 2, 3…« and take place at the »Swallowz« in the Kégué district, a large outdoor basketball field made of concrete on which at least four basketball games could be played simultaneously. One of these groups is the New Star Dance Company – a hip hop mix group from Ghana, founded by Meier Edem Akakpo, who has already been dancing at the age of 5 with his mother’s ballet company »Red Monster«. 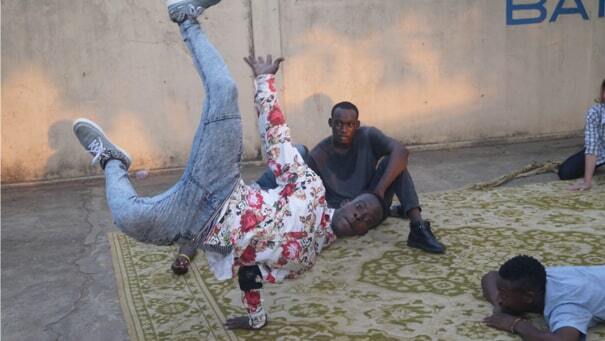 At 16, he graduates from high school and then receives a diploma in hip hop and contemporary dance in Accra. He and his company move to Lomé, where they receive many awards over the following years. In 2016, Anne Tismer, who at that time mainly lives in Togo, where she is developing Live Art pieces and performances and taking studies in afropop at the Bloque Culturel of the University of Lomé, becomes a member of the company. While still in Togo, she takes part in three dance performances with the group. In 2017 Meier Edem Akakpo and Anne Tismer move to Berlin. They now train in rooms with real dance floors or in the Tentaja in Hangar 1 of the former Tempelhof airport. Sometimes, when the weather is nice, they also train on basketball courts. In Berlin, Nuria Höyng and Dominique Wenzel join the group, too. Nuria Höyng studies at HZT Berlin and develops a form of movement that works with the programming of perception and blurs the boundaries between body, environment and time. She is interested in movement as a technology of processing and creation. Dominique Wenzel studied stage dance at the Folkwang University of the Arts in Essen and spent time with the Trisha Brown Company in New York. She is also an Integrative Dance Therapist DGT | FPI cand. at the Fritz Perls Institute. Supported by additional guests and students of the British School of Berlin, Sample 1 Lomé – Berlin is the company’s first attempt in Berlin. Running time: approx. 1 h.
A New Star Dance Company production in cooperation with Ballhaus Ost.